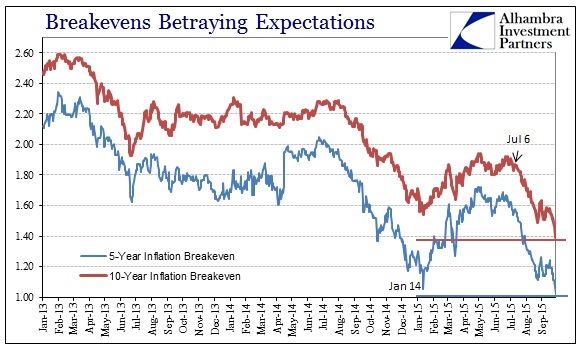 Before embarking on the great unknown of Q4 2015, it makes sense to try to gain a little more clarity about Q3 2015. 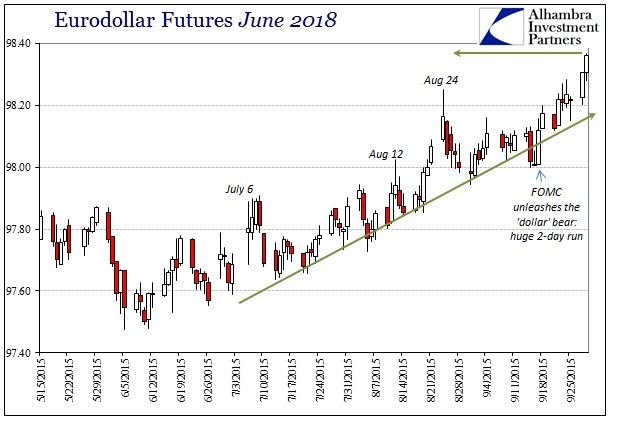 Specifically, the “dollar” run that blasted through China and opened the prospects for both an end to Fed/Yellen faithfulness and increasing uncertainty about the true nature of economy and finance globally began around July 6; a day (or thereabouts) that shows up in an awful lot of “dollar”-related activity. That date is noteworthy for several reasons, including the midst of the Chinese stock crash and being within that bottleneck “window” of the first few weeks after quarter-end. It was also the day after the Greek vote on creditor terms. By all surface considerations, Greece just should not matter. It is a tiny country with a small economy (even comparative outside of Europe) and a truly shriveled banking network. The financial foibles have been well-documented for more than half a decade now, so surely “contagion” and exposure no longer exist. The population of Greece is slightly less than the state of Ohio’s, while its gross domestic product is just a little bigger than the economies of Kazakhstan, Algeria and Qatar. Instead of focusing on Athens, investors should be much more worried about what’s going on in China. You know, that country with about 1.4 billion people and the world’s second largest GDP? It is difficult to disagree with that sentiment at any point, including and especially the relative scale of the Chinese meltdown by comparison. However, there does not exist, particularly in the “dollar” world, such certain mutual exclusivity. 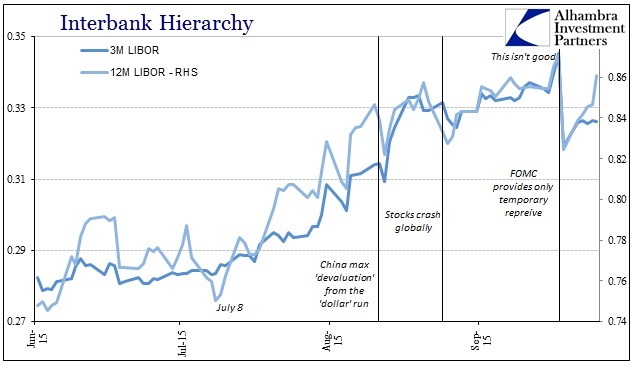 Clearly, in the “dollar” context, any connection would be made via eurodollar bank operations (to be clear, I am not claiming that the affairs of Greece, even any “dollar” spillover, caused China’s stock crash, only suggesting that the “dollar” run that would follow was a self-reinforcing and compatible circumstance). Oil prices suffered their biggest selloff in five months on Monday, falling as much as 8 percent as Greece’s rejection of debt bailout terms and China’s stock market woes set off a deepening spiral of losses. Adding to the pressure on oil, Iran and global powers were trying to meet a July 7 deadline on a nuclear deal, which could bring more supply to the market if sanctions on Tehran are eased. The self-imposed deadline could be extended again, officials at the negotiations said. Like Credit Suisse, Deutsche had held on to its derivatives portfolio (for what we can find, the bank provides little information outside updates included in the notes of its annual report) whereas its eurodollar peers had already made significant progress in repositioning for the “dollar” we know of now. The ratings action of early June, however, must have been another stark kick in that direction, putting to the math what everyone else was seeing all along (except for Deutsche’s former co-CEO’s, obviously). In deciding on June’s downgrade to that BBB+ rating, S&P also made it clear where that downgrade was coming from, especially as it related to the bank’s “anchor” rate of A-. Deutsche Bank, Barclays Bank and the Royal Bank of Scotland were among a handful of European banks downgraded on Tuesday by Standard & Poor’s, amid concern that state support in a crisis is now ‘uncertain’. Analysts with the rating agency warned that it was unclear what support even systematically important financial institutions in the UK and Germany would receive, following the recent implementation of the European Union’s Bank Recovery and Resolution Directive. While we do not rule out the possibility that systemic banks in these countries might receive extraordinary government support, we see the predictability of such support as having materially reduced to the point that we regard it as being “uncertain”. Then, on July 5, the Greeks vote against the preferred creditor option which only added to that same directional “uncertainty.” In rejecting the bailout terms, Greece was provoking further political wariness not just about the specifics of Greece but “bailouts” in general. What would you do as Deutsche Bank on the day after the vote? S&P had, less than a month before, knocked you out of the A tiers because of your “risk position” which includes derivatives exposures that have already seeded negative perceptions all the while making it clear that is a problem (for esoteric regulatory concerns like the various and sundry capital ratios) amplified by political, bailout exhaustion. It might make sense to accelerate the intended shift, especially with a new CEO trying to make his mark. Those questions pertain beyond just Deutsche Bank to the others that were included in the S&P action (and, it should be pointed out here, that Fitch issued a downgrade for the same reasons on May 29), though I think given Deutsche’s massive imprint in “dark leverage” especially how the bank had continued its portfolios long after others were in full-blown cutbacks (thus, marginally, making Deutsche far more important in the past few years as one of the “few” still providing those deeper eurodollar liquidity elements in at least similar scale) the German bank makes for the most logical center of the “dollar” run past July 6. 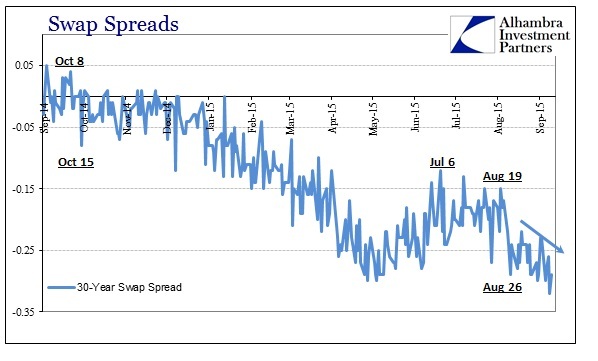 European wholesale operations thus affected will certainly translate into eurodollar behavior; maybe even more so because it is undoubtedly the “dollar” to which Deutsche (and the others) is seeking to shed in order to focus “capital” more locally and less inefficiently sprawling. There are, obviously, more than a few assumptions and degrees of conjecture on my part. Given that caveat, I do think them quite reasonable particularly in view of the chronology and the nature of the “dollar” outbreak. The wholesale “dollar” is eminently unobservable so we are left to second and third-hand interpretations, but here again I think the explanation offers the greatest fit (admittedly still incomplete) to all possible angles. 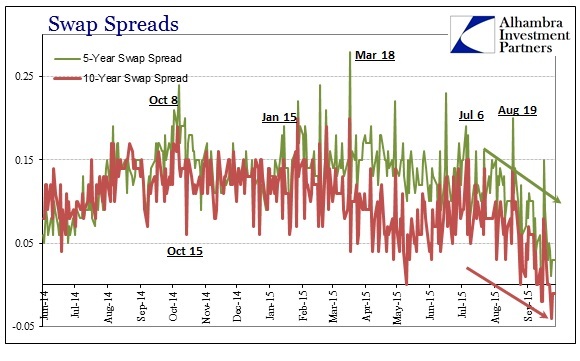 In this specific case, that means that eurodollar banks are removing themselves in uneven fashion, which has been obvious for some time; thus, the Greek vote may have triggered a specific intensification and acceleration of that general trend. In that sense, Greece doesn’t matter as most people stand in wonderment about the affair, but it does matter in the same context as chaos theory applies uncertainty in a complex system – in colloquial understanding of chaos, Greece was the butterfly though not necessarily an unexpected one. Oil’s biggest slump in four years will lose momentum because the plunge in Chinese equities and Greece’s economic crisis won’t dent global demand, according to Morgan Stanley, UBS Group AG and Societe Generale SA. Crude is set for a “modest recovery” after declining 13 percent in the five sessions through Wednesday, Morgan Stanley estimates, while demand will push prices up by year-end, according to hedge fund manager Andrew J. Hall. Any nuclear deal with Iran won’t quickly revive the OPEC member’s crude exports, so wouldn’t immediately weigh on prices, Societe Generale said. “The market has no need to re-test the lows” of $42 reached in March, Paul Horsnell, head of commodities research at Standard Chartered Plc in London, said by e-mail Thursday. “Iran will be slow to return even if there is a deal. And the longer the market stays low, the greater the squeeze on supplies” from outside OPEC. The combination of Greece, Iran, China and an unexpected expansion of U.S. crude stockpiles combined to bring down prices, said Mike Wittner, head of oil market research at Societe Generale. 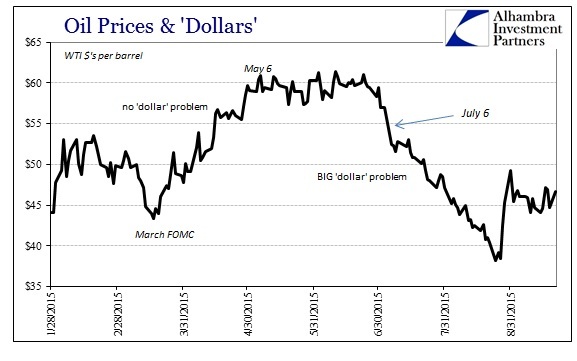 The “dollar” had (has) other ideas; all of them relate to “unexpected” demand problems.